This pub has completely changed, having recently reopened as a gastropub. I didn't try the food, but it smelt good, and the diners, who constituted the majority of the clientele, seemed to be enjoying their dinners. The pub has clearly moved upmarket. There were at least four real ales available, including Conservation from the Red Squirrel brewery, while I had a pint of Olde Trip from Hardy & Hanson. My pint was not bad but could have been a little fresher. The bar staff however were a little amateurish, and it took two of them five minutes to deliver my pint and my mate's half. This pub is now more of a restaurant, but I guess if that's the price of keeping open we have to accept it. If you're a real ale drinker who likes a more traditional pub, I'd recommend you try the Swan in the next street. I went in this pub for the first time recently and, as it hasn't been reviewed recently, I thought I'd register and add my two pence worth. Apparently this pub was refurbished in late 2013. It is no longer a trad old boozer but is more like a bang on trend gastro-pub with olive and khaki paint and those filament light bulbs you see everywhere now. People who like trad old boozers are going to the Swan in the next street. 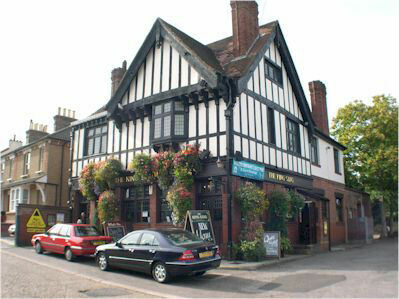 The landlord is new to the trade but is enthusiastic and is making a success of it. Obviously it is food led now but is a Green King "Local Hero" so the GK microbrewery tries out new brews here and the landlord is allowed to choose non-GK ales. The lagers are Estrelle and Tudor. Ales were perfectly acceptably kept and you can have a straight glass or a jug. Worth adding to any Bushey pub crawl. What a great old traditional boozer! Good beer, friendly staff and Britain like it used to be. If they cud put Sweeney on the TV, blue bag of salt in the crisps, Supercockle at 9.30pm and a row of Ford Anglias and Consuls in the car park, it wud be perfick. Very well presented pub. Beer is Green King so I had a pint of Gunniess. Just been in the King Stag after it's refubishment, it a totally different place.